Ahead of the final round of games that kick-off tonight, Real Madrid stand on the edge of history in the UEFA Champions League once again. Not only are the defending champions the first team to win the trophy 10 times (including pre-Champions League days) after their success in May, but tonight they have the opportunity to become the first team to win all six group stage games for the second time. In fact the 100% group stage record has only been completed five times in the past, so we thought we would look back at how those teams fared in the greater scheme of the Champions League. This was the first ever year with a group stage and AC Milan took to it with great aplomb. Marco van Basten was the star as they romped through a group with Gotëborg, PSV Eindhoven and FC Porto. They also only conceded one goal in the group while scoring 11. Of course that form carried them all the way to the final where they were beaten by 1 goal to nil by Olympique de Marseille in Munich. This remains the closest a side with a perfect group record have come to winning the Champions League. Before the oil money, before Zlatan and before Laurent Blanc, PSG were a force to be reckoned with in the Champions League. 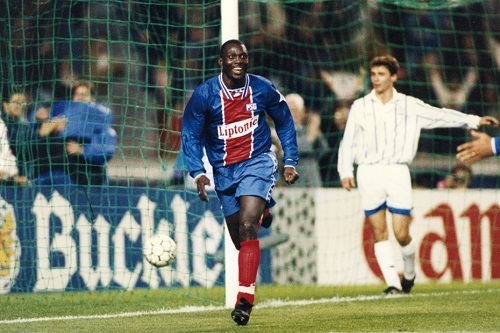 Inspired by Liberian George Weah, PSG secured 6 victories against Bayern Munich, Spartak Moscow and Dynamo Kyiv. 4 of the games were decided by one goal including a 1-0 win in Munich. Having overcome Barcelona in the Quarter-Finals, the French side were dreaming of glory. That glory was curtailed by AC Milan who knocked them out with two clean sheets in the semi finals of the Champions League. Probably the surprise inclusion in this list is the Russian side of 1995. They started with a narrow win against English Champions Blackburn Rovers and winning at Polish Champions Legia Warsaw. They really hit their peak with back-to-back wins against Rosenborg (After trailing 2-0 at half time they won 4-2) and cantered home in their remaining games. It was French side Nantes that stopped the dream winning 4-2 on aggregate in the Quarter Final. This was before Barcelona’s true spell of dominance that lifted the quality of European Football. This was when current coach Luis Enrique was still bombing down the wing. The group stage of the Champions League saw Barca emerge with 6 straight victories against Club Brugges, Galatasaray and Lokomotiv Moscow. There was a second group stage in the competition back then and Barca emerged from this (against Newcastle, Leverkusen and Inter Milan) and into the final 8 where they fell short at the hands of Juventus. Madrid have done it before, but this was not Ancelotti’s Madrid, this was Mourinho’s Madrid. They skipped through their group stage winning it by 10 points easily bypassing Dinamo Zagreb, Ajax Amsterdam and Olympique Lyonnais. They scored 19 goals in the process while only conceding two. Jose was poised to lead a third team to Champions League glory. But the glory of penalties saw the special one come undone again as Bayern Munich progressed to the final where they would lose out to Jose’s previous club Chelsea. Of course if Real Madrid do beat Ludogrets tonight they will then have two “Curses” hanging over their heads. No team has defended the Champions League and no team has won the cup after winning all games in their group stage. Of course if one team can do it, it most certainly is this Real Madrid.